Stems: Erect, stout, simple or sparingly branched, glabrous, waxy, prominent swollen nodes. Leaves: Opposite, simple, short-stalked or sessile, usually in 10-20 pairs, elliptic to elliptic-lanceolate, 1.5 to 4 inches long, .5 to 1.5 inches wide, glabrous; veins 3, parallel, prominent; tips pointed; lower leaves usually absent at flowering. Inflorescences: Cyme, up to 6 inches long, terminal or in upper leaf axils. 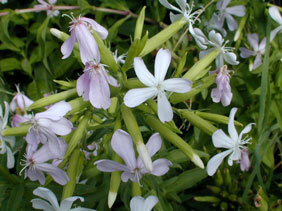 Flowers: Showy, fragrant, about 1 inch across; calyx green or purplish, not ribbed; lobes 5, triangular; petals 5 (sometimes more), 1/3 to 3/5 inch long, clawed, white to pale pink, tips notched; stamens 10, exserted; styles 2. Fruits: Capsule, egg-shaped, about 3/5 inch long; seeds numerous, kidney-shaped to circular, flattened, dark brown. Habitat: Roadsides, waste areas, shelter belts, and fence rows. Distribution: Throughout Kansas; more frequently in east 1/3. Origin: Bouncing bet is native to Europe and now naturalized in the U.S. Uses: Europeans and Native Americans used the plant as a soap substitute. The crushed roots and leaves lather when mixed with water. The root juice was also used as a hair tonic. Comments: Reproduces via seeds and rhizomes; tends to be found in colonies. The seeds can cause digestive disturbance in livestock.